The ganches dedicated to us, the late night negotiations with our local ungers over when we would finally have to get some sleep, the impromptu khorovats– all things that I continue to miss a full five months upon our return to America. Every little face in my 1,200-picture photo album has a story and an inconceivable power to make me wonder. I wonder where they will be in life the next time I see them, I wonder what they are up to at this very moment, if they remember me and all our memories together. I wonder if they were aware that just as they admitted to counting down the hours between each camp day, they were who I rambled on and on about to those at home during those same hours. However, this is not to discredit the unexpected difficulty we faced in establishing relationships with local children. The initial reaction we received from the campers was one of defiance, leading us to think hard about why we were being put to a test, and how we would overcome it. I can remember my first day at my first camp with just one word – madness. New and veteran badanis alike were running up and down the school corridor, exclaiming greetings, unable to contain their excitement, while I sat behind the sign-up desk in shock. There was a fully established dynamic amongst these kids – how was I expected to make a place for myself within it. Any sense of order that we tried to bring to this camp had completely vanished. It was time for the Plan B we did not have. I remember going home the first few days, exhausted, with tears in my eyes. It was made known that our Western dialect was almost incomprehensible, our clothing, unusual, and my blonde hair and blue eyes, too foreign. I had accepted that there was no way my campers and I would come to understand each other, as I thought anxiously about the six long weeks ahead of me. It was in these first few days that I would learn what I was truly here for. Within all the understanding of what being an Armenian is, there are the misunderstandings of the various places we all come from. It came time for the AYF Youth Corps team to bridge this deeply-rooted gap. The sentiment was blatantly revealed on the third day of camp, when the classroom discussion topic turned to hayrenasirutyun – love for one’s heritage. One of my oldest campers, and one of the brightest young women I have met, expressed that hayrenasirutyunarises and dies in the hayrenik – the motherland. 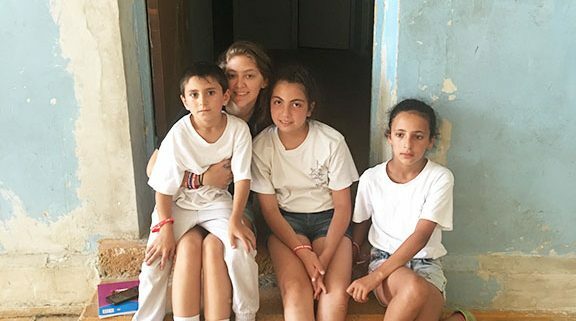 She expressed her resistance toward us by communicating her disapproval for those who chose to live outside of Armenia, and namely, leaving their responsibility of serving in the army – a sensitive subject in the lives of the many children we met. This put me at a loss; for words, thoughts, even a simple reaction. I felt more defeated than I could ever remember feeling, and I could not think of the rights words in response. Luckily, my local co-counselor did not miss a beat, as he went on to explain that Armenians in the diaspora are soldiers of a different war – maintaining hayrenasirutyun. What most of our campers did not realize was that a lot of diasporan families did not choose to leave Armenia… It was the result of the genocide. And with this displacement came a great deal of effort to relocate and further cultivate our language, traditions and lifestyle in an otherwise foreign place. There was a short silence in the room before the argument went back and forth a few more times, never truly coming to a consensus. I left camp that day not wanting to return. Day 4 was a completely new ball game. One of my campers had painted a noor on a stone as a gift for me to take home, several other girls asked if they could braid my hair into two French braids with the combs and hair ties they brought from home, and a boy whose artistic talents I was completely unaware of gifted a portrait he sketched of me at home. Just like that, my group of campers and I became inseparable. Each morning, someone brought my co-counselor and I an assortment of fruits and snacks for breakfast. Our game-time consisted of English hangman, as requested by the campers who were eager to learn new English words. During our discussion period, the badanis even wanted to learn all about the communities we came from, and how we accomplish coming together for events, learning the language and raising new generations with a sense of our culture and motherland. Defeat turned into pride on this day. I was excited to share my diasporan experience, as it was never something I patted myself on the shoulder for, and to learn more about the deghatsi’s daily life. 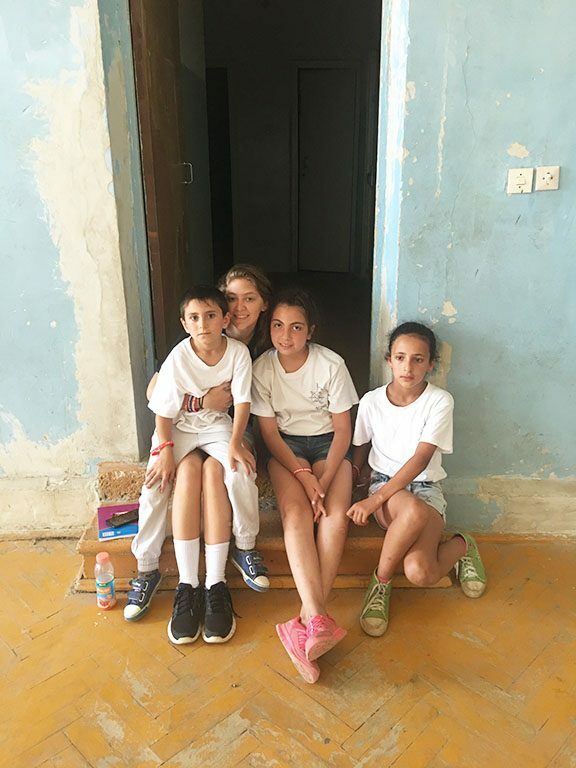 At the closing of this camp in Gyumri, excessively long hugs were exchanged between people with tearful eyes, mementos were swapped, and vows were made to never forget each other. I could not thank the AYF enough for giving me an experience that showed me something larger than myself. Beyond all that we do on a daily basis to keep our roots alive outside of our motherland, there is a need for a greater exchange between these two bodies. A mutual understanding can obviously lead to strong, supportive relationships, and that is what all Armenians should strive for – to never forget about each other. To apply to AYF Youth Corps, or get more information, visit ayfyouthcorps.org.